The 4th of July is just around the corner so I figured it was time to make some Patriotic Play-doh with Charlee Ann. We had a blast making the play-doh and she really enjoyed making the snakes to put on the flahg(that’s what she called the lines we made). This play-doh recipe is the easiest I have ever made and it holds up really well over time. It is super soft and pliable and is much easier for her to play with at the age of three. 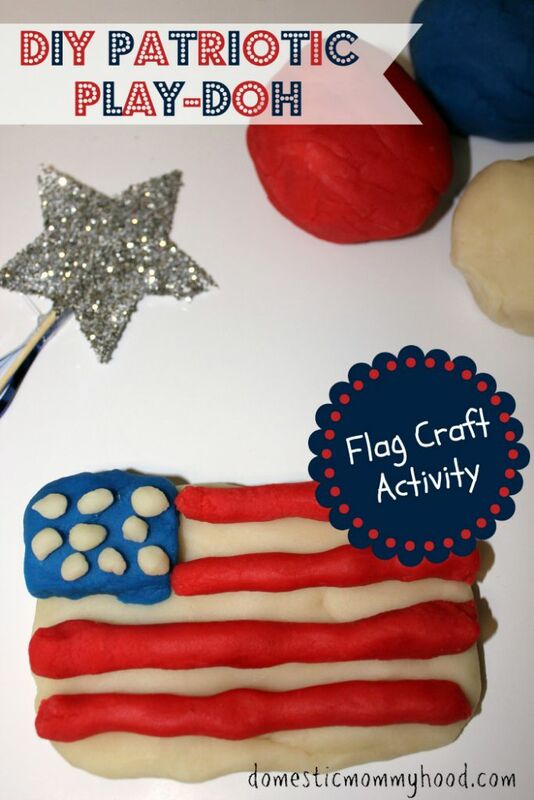 The flag activity is easier to do with older ones but still pretty simple to do with the younger ones. You just may have to give them a little assist when it comes to putting it together. Remember that with kids the end product is NOT what is important. It can be the ugliest thing you have ever seen but you will let them know how beautiful it is. 🙂 I absolutely hate when our children are not allowed to be a budding artist. Don’t change what they do just to make it look like a flag. Let them be creative and praise them for the good job that they did. <<**Great parenting tip here! Don’t miss it 😉 Now it’s time to get to making some fun with this fantastically easy play-doh recipe. 1) This play-doh is one of the easiest things you will ever make. Throw all of your ingredients except the food coloring into a pan and heat on medium heat. 2) Stir ingredients well and continue stirring until it starts to thicken. 3) Once is starts to thicken add in the food coloring or food coloring gel until desired color is reached. 4) The mixture will begin to pull away from the pan and form a soft ball. Once this has happened you will need to carefully dumb the ball onto a cutting board and let cool for about 20 minutes. Once we got all 3 colors done we had a great time putting the flag together. Charlee Ann loved making the red part of the flag! She kept screaming “Oh no Mommy! The snake is gonna get you!”. We had a great time and I hope you have fun with your own children. Do you have a good homemade play-doh recipe that works well for you?? Please leave the recipe in the comments below so that we can all give it a try!